The nose is full of black cherry and plum with a hint of spice. The palate is rich in texture, sweet berries and juicy fruit. 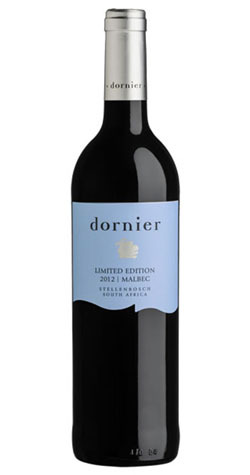 The idea behind this range, was to showcase single varietals grown on the Dornier Estate. Produced only in very small quantities, these wines have been nurtured to bring across the true expression of the Dornier Terroir as well as the unique characteristic of he single varietal. The nose on this wine is full of black cherry and plum with a hint of spice. The palate is rich in texture and shows characteristics of sweet berries and juicy fruit. The finish is long with a balanced acidity and fine tannin structure. The vines are planted on our homestead farm, where the soil is composed granite and shale, covered with a mantle of sandstone material. The vines get full sun which allows for optimum development of rich berry characters in this variety. This wine was fermented in open stainless steel tanks with gentle pump overs performed twice daily as to only extract the elegant soft tannins. After primary alcoholic fermentation the wines underwent malolactic fermentation followed by 12 months aging in second and third fill French oak barrels, to retain the fruit flavours of the wine. Dornier is a family-owned, sustainably-farmed Stellenbosch winery specializing in Chenin Blanc and Bordeaux varietals. Dornier’s loft-style winery is a new attraction in the Cape Winelands. With its curved roof and the use of face brick and reflecting materials, the building blends creatively into the dramatic scenery of Stellenbosch Mountain. The style of the winery is a visual translation of their wines – elegant, clear yet complex and distinctly unique.